If you suffer from itchy feet and ankles, you probably know first-hand just how uncomfortable this condition can make you. You might be tempted to ignore this problem, thinking it is not very important, but be careful: while some of the reasons for itchy feet are minor and can be corrected easily, some can mask more serious conditions. Read on to find out more about the most common causes of this problem. One of the most common causes of red, itchy feet is an infection. Athlete’s foot is an infection caused by a fungus. (1) Its medical name is tinea pedis. This infection is contagious that can be picked up by walking barefoot in areas like public pools or locker rooms. Apart from itchiness, your feet may also be red and stinging and the skin may blister, peel or crack. There can also be oozing or weeping of the infected areas. It is also possible for this fungal infection to your hands (called tinea manuum) or to the groin (called tinea cruris). In adults, itchiness can also occur on the arms and hands and the skin can blister, peel or scale. Another common sign is the presence of burrows, where the mite has tunneled under the skin itself. This can happen more frequently to people who live in crowded communities like nursing homes or those who have a weak immune system. Treatments can include the washing of bed linens and towels and heavy carpet cleaning as well as the use of antihistamine pills like Benedryl. However, while these treatments might help with symptoms or to prevent the spread of the disease, medications called scabicides will be needed to kill off these mites and truly cure the condition. The most common of these are Elimite and Lindane. They both come in creams and require a doctor’s prescription. However, they can be picked up when vacationing abroad. These parasites can come into contact with humans by walking barefoot on a ground where hookworms have laid their eggs, but this infection can affect more than the feet: the heart, lungs and digestive tract can be affected as well. The blood loss can be so severe that it can cause anemia. Treatment for this problem revolves around anthelmintics medications like Albendazole (marketed as Albenza) to kill off the hookworms. Anemia can be treated with iron supplements. Sometimes, however, a blood transfusion may be needed. Diabetes is a serious chronic condition which can impair the body’s ability to use carbohydrates and can result in episodes of high or low blood sugar. It is estimated that 28 million Americans have this disease — and the numbers are only predicted to grow in the coming years. This condition causes itchiness of the hands, ankles and feet as well as on the limbs and buttocks and can cause raised yellow bumps surrounded by areas of redness. If you have this condition, it is serious because it means that your diabetes is not being well-controlled. However, there are ways to improve the management of your diabetes. Taking blood sugar regularly, watching your diet and counting your carbohydrates and taking your pills or insulin as directed can help. If your diabetes does get under better control, the eruptive xanthomatosis will resolve over a few weeks. If you are diabetic, however, paying attention to skin health is still important: you are at greater risk for problems like liver disease and peripheral neuropathy (see the section below) which can also cause dry, itchy skin. 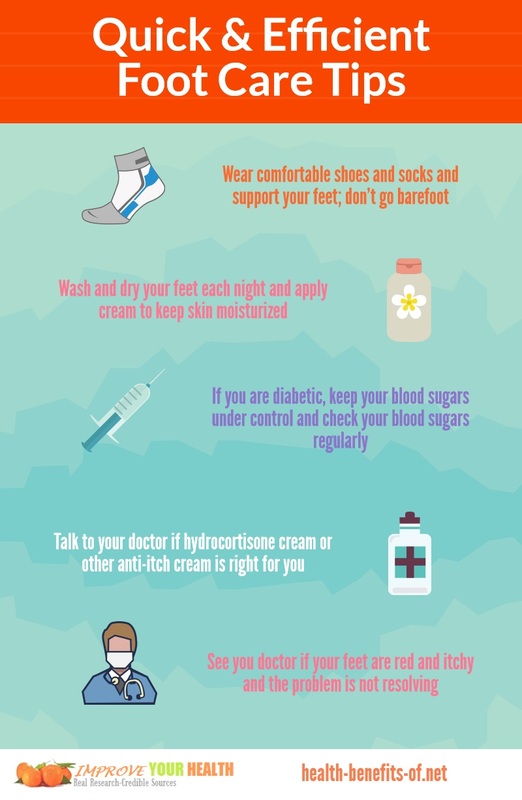 One of the reasons that reporting itchy feet or ankles is that sometimes, skin conditions like this are the first sign that you do have diabetes: sometimes, patients can go for a year without a diagnosis for this condition. Often, these skin conditions are important because they are one of the first signs that diabetes is developing. Other signs can include an increased hunger and thirst and increased need to urinate. Getting your blood sugar tested at the doctor’s is simple and can establish a diagnosis. An increased lack of coordination and clumsiness are common and this increases the chance for falls. In some cases, people with this condition can also experience problems with their digestive and urinary systems. There are many causes of peripheral neuropathy. The most common ones include being a diabetic and drinking too much alcohol. Injuries or trauma to the spinal cord and brain, being exposed to toxins in the environment can also lead to peripheral nerve damage. However, some cases are idiopathic, which means that there is no known cause for the problem. There are also a number of risk factors which can make it more likely that you will develop this condition. There is no cure for peripheral neuropathy, but it can be improved if the underlying causes are treated. And there are many treatment options available that can help control symptoms like itchiness. Pain medications can help relieve discomfort. Anti-epileptic drugs like Neurontin or Lyrica and anti-depressants like Cymbalta or Effexor can also help with pain and other symptoms of the neuropathy. Another medication which can help is capsaicin cream, which uses the active ingredients that give peppers their heat to block the signals of pain that the nerves send to the brain. The use of a transcutaneous electrical nerve stimulation (TENS) unit can also help to stimulate the nerves, while some patients also find it helpful to use casts or splints. It is important to point out, however, that no treatments can stop the progression of this disease and that symptoms will generally worsen over time. Normally, skin cells reproduce themselves and are sloughed off regularly to make way for new skin cells to take their place. In people with psoriasis, however, this system can break down — and it is estimated that people who have this condition actually have skin cells which reproduce ten times as often as normal. The skin can also look like it is covered in silvery scales. The most common form of psoriasis is plaque psoriasis, but other less common types exist as well. If itchiness and redness on your ankles and tops of feet are caused by psoriasis, it is important to report this to the doctor. If psoriasis does go untreated, it can lead to psoriatic arthritis, a condition which leads to pain, stiffness and lack of mobility in the joints. The damage it can do is irreversible. What puts you at risk for psoriasis? Psoriasis can be difficult to treat, but the good news is that there are a number of different ways to help alleviate it. Moisturizing creams can also help with this condition. Thus, itchy feet and ankles can be more than just an inconvenience: this problem can be one of the first signs of a more serious issue — like diabetes or peripheral neuropathy — that needs more advanced medical attention. 3 Habits That Are Destroying Your Health!